When you&apos;re out at dinner in China, there is no such thing as "different courses", and even “dessert” dishes you have ordered will turn up whenever they&apos;re ready. This is fine in China since you will be sharing all the dishes anyway. One of the main ingredients in sweet snacks and desserts is red bean. hough this may sound unfamiliar, red bean paste and red bean fillings are delicious. You&apos;ll certainly encounter this filling when in China, generally when you&apos;re expecting chocolate (due to the similarity in color). Red bean buns are the popular sweet version of the baozi, or steamed bun, consisting of a steamed bun filled with red bean paste. 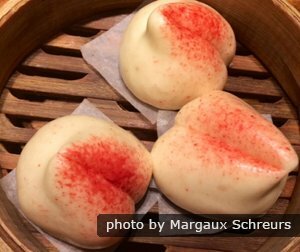 These buns are the most popular way of presenting red bean paste. 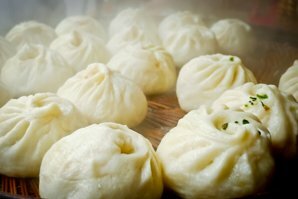 The buns come in a variety of different shapes and sizes, and are popular throughout the entire country, but especially popular in the North of China. You can get them in a restaurant, steamed, in different shapes as shown above, or you can get them in the supermarket for on the go. 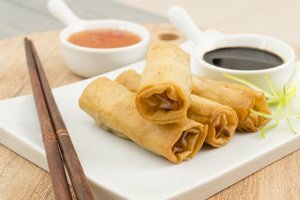 There are also various variations of this bun with different fillings, think pine nut kernel paste, taro paste, or even black bean paste. Dragon&apos;s Beard Candy is not only a type of Chinese candy, but it is also considered a traditional art as it originates in the Han Dynasty. It is similar to candy floss as it is made of spun sugar, and is very sticky. It melts easily, and becomes even stickier, when it is exposed to high temperatures. This food is generally sold by the side of the road, or at stalls near popular tourist destinations. 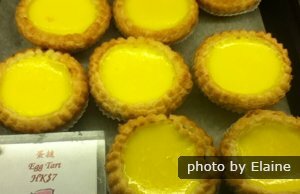 The egg tarts were first introduced to Mainland China via Macau, by Portugese colonizers. It is basically a little custard tart, with a hard and sweet crust. They are best eaten warm, and usually found in Cantonese-style restaurants. They are so popular that some shops specialize in them (generally hole-in-the-wall shops), and many convenience stores sell them too, pre-warmed. These are easy to pick up while sightseeing. 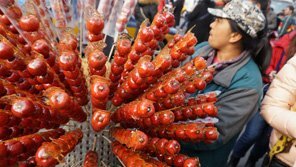 Tanghulu, the "Chinese toffee apple" is an old Beijing-style snack consisting of a skewer with crabapples dipped in liquid sugar and dried. 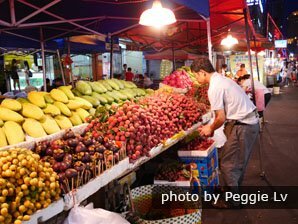 Common varieties, especially at food markets and China&apos;s popular food streets, include other fruits coated in sugar, such as kiwi or grapes. These are most authentically bought from carts by the side of the street, and in Beijing they are hard to escape at common tourist sites. Pumpkin pancakes are easily described: they are deep fried pumpkin pancakes consisting mainly of pumpkin, sugar, and flour. 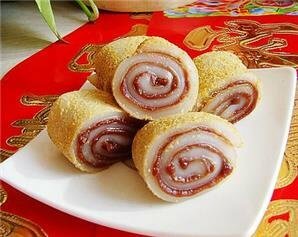 They are very popular in winter, and are some of the sweetest things around in China. In fact, they may be too sweet if you aren&apos;t a big fan. In some cases, the pumpkin pancakes are covered in roasted sesame seeds for extra taste and texture. 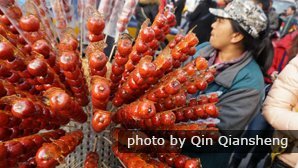 They are available in most Sichuan-style restaurants, as this is where they originate from, but they are so popular that many big restaurants serve them. Another Southern Chinese favorite, the sweet egg bun consists of a warm bun filled with a mix of egg yolk and sugar. Although this may sound odd, these buns are highly popular and definitely worth a try. 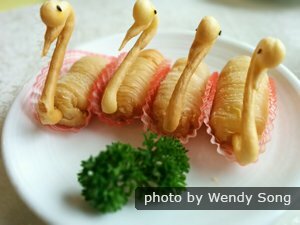 They are commonly found at Cantonese restaurants, and are perfect for those with a sweet tooth. Durian, Asia&apos;s most infamous fruit, is also popular in China. Although infamous for its strong and bad smell, the fleshy fruit tastes good and is very popular. 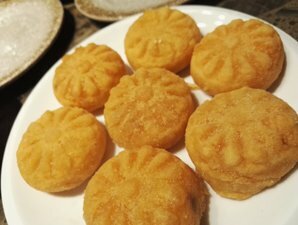 Many Chinese restaurants sell it as a desert, with a slight deep fried batter crust. The perfect dessert for anyone wanting to step out of their comfort zone. Also makes for the perfect story with friends at home. This dessert is more common in summer, as this is when the durian is in season. Tip: do not touch it with your bare hands as you will have trouble getting the smell off your hands. Tangyuan is a warm soup that originates in Sichuan cuisine and is a staple food on any Sichuanese restaurant&apos;s menu. It is sweet and filled with fermented rice and sticky rice balls. 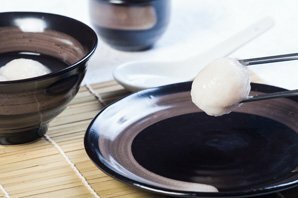 Sometimes, because of the fermented rice, the soup can be a little bit alcoholic and taste like Southern Chinese mijiu, or rice wine. This soup is usually eaten at large family meals because of its name, which is similar to the phrase for &apos;family reunion&apos; (tuanyuan twan-wyen 团圆). Tangyuan is a traditional food eaten during the Lantern Festival, which is celebrated on the 15th day of the first month of the lunar calendar, the first night in the lunar calendar to see a full moon, which the round rice balls are symbolic of. Almond jelly is a cream colored jelly with a soft consistency commonly eaten in across the country from Beijing to Hong Kong, and the South of China. The name is somewhat misleading, as the dessert is generally made using apricot kernel, which is soaked and grounded with water. The milk is then extracted, and a gelling substance is added. This dish is available in most Chinese restaurants. Another type of jelly commonly eaten for dessert is grass jelly. Grass jelly is not only famous in China, but is also a popular food in Southeast Asia and Taiwan. It is made using boiled &apos;fairy grass&apos; (仙草 i.e. mesona chinensis, a type of mint) and adding starch and a baking salt. Grass jelly can be eaten in many different forms, either as jelly, in drinks, or mixed with condensed milk, the latter being commonly available in Chinese restaurants. Have a sweet tooth? Let us know when you book your tour and we can show you China through its desserts. Are there some specific desserts you want to try from this list? We can customize your itinerary accordingly, just contact us to start planning your trip.